New Sportage based on Hyundai Tucson. Has 112PS 2.0 litre common rail diesel with 245Nm torque from 1,800 - 2,500rmp, 140 PS 2.0 litre petrol engine or 175PS petrol V6. Can be ordered front wheel drive only (in some markets), or four wheel drive. Four wheel drive distributes power evenly 50/50 front and back. All come on 16" wheels with 235/60 R16 tyres. All have ABS with EBD. In UK Janaury 2005 from £15,000, with two wheel drive model possibly arriving later at from about £12,000. Handles as well on the road as a RAV-4. KIA showed a hydrogen fuel cell (FCEV) version at the Paris Show in September 2004. Diesels from a bargain £15,695 for the 2.0 CRDi XE manual (automatic £16,695). Higher-specified XS manual £17,195 (automatic £18,195). 4,350mm x 1,840mm x 1,730mm. 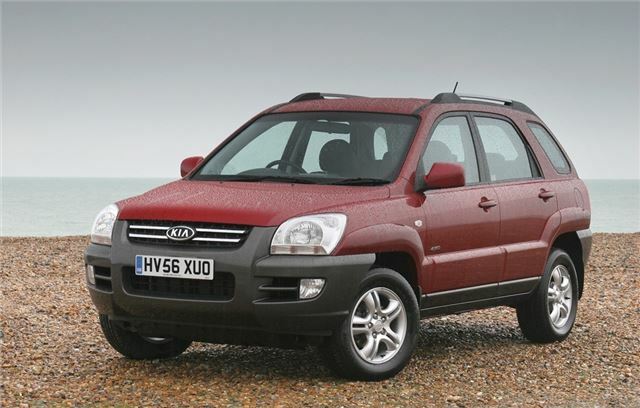 2008 Sportage announced. Now built in Zilina, Slovakia, in the same factory as the Cee'd, the 2008 Sportage has a new front bumper, grille, wing mirrors and headlights. PAS has been re-calibrated to be more responsive while new dampers provide a firmer ride with less body roll. Braking power has been increased with a change from 15-inch to 16-inch brake discs, transmission ratios have been adjusted and the towing limit has been increased to 1800kgs. All seats have been remodelled to cater more for European shaped drivers and passengers and indicator stalks have been moved to left side of the steering wheel in response to customer feedback, now used to having the indicators on the wrong side for RHD. Entry level is XE, XS adds more kit, range topper is called TITAN, offering ESP, electric sunroof, privacy glass, heated seats and automatic rear view mirror. Two-wheel drive version also available bringing the entry level price down to £13,995 on-the-road. A diesel-automatic 2WD is also be available. 2008 Sportage come with a seven-year, 100,000-mile warranty and an improved corrosion warranty of 10 years. Diesels available November 2007, petrol from early 2008.